You know that craving of sweet treats that tends to creep up after every study session? Wouldn’t it be just absolutely amazing if you knew how to whip up a savory bite and make everything right in your world again? Well, the dynamic Chef Simone could save the world with her delicious baking goodies which includes her famous Snicker Brownies! 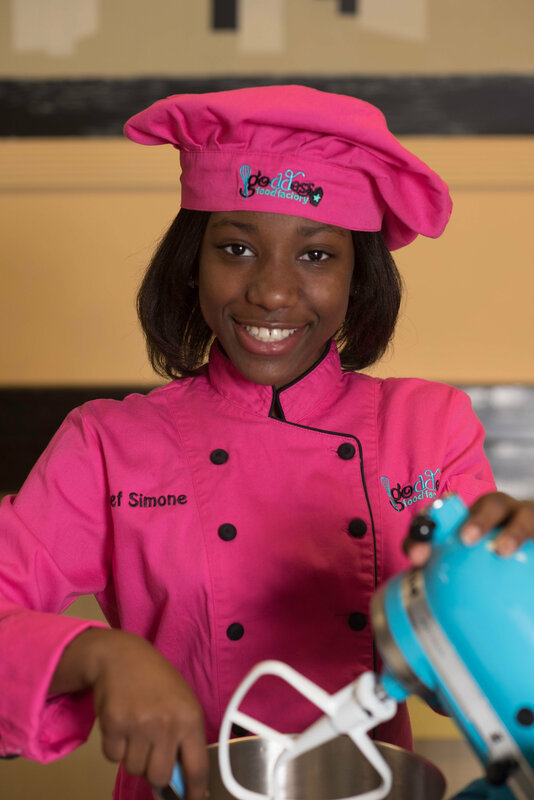 Hailing from Florida, Simone Bridges is a popular Kid Chef + the owner of Goddess Food Factory located in Jacksonville. Her addictive pastries have received raving reviews by celebrity chefs, radio hosts, athletes, and tons of food lovers all over the nation! 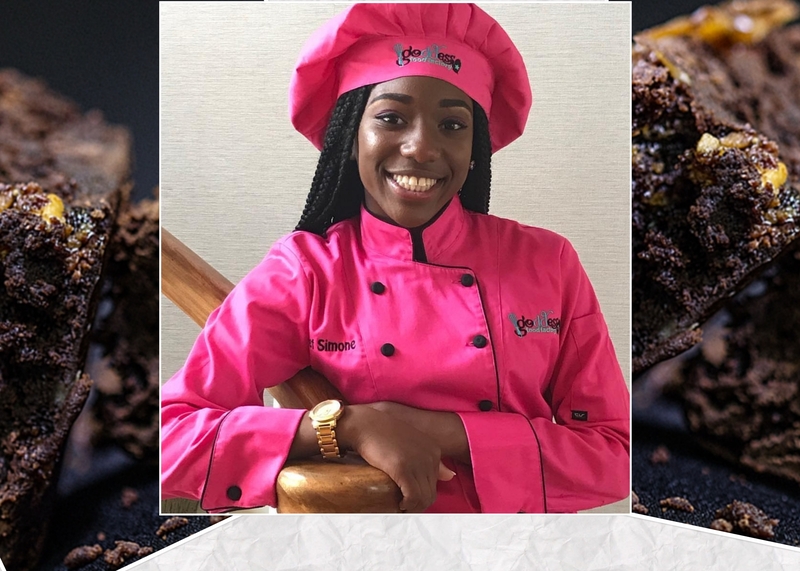 Simone has been featured on Steve Harvey’s talk show where she shared her recipe for success and the two of them emerged in laughter as she showed him how to make her famous Snicker Brownies. 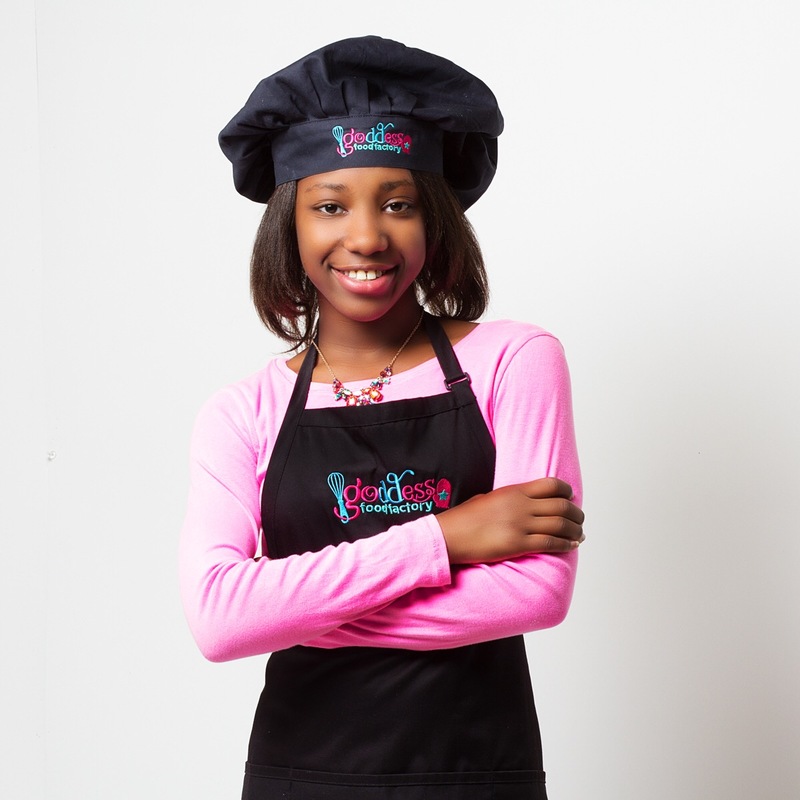 Her love for baking is not the only passion this dynamic young lady is conquering! As a student at Darnel-Cookman School of the Medical Arts her love of Science and Mathematics has also coined her the nickname of the STEMchef. She incorporates the academic concept of STEM into her baking, especially when teaching her popular cooking classes for kids. Due to an overwhelming number of requests for her recipes and her love for STEM, she created ExS.T.R.E.A.M. Baking Subscription Boxes. They are monthly subscription boxes in which she infuse baking and cooking with Science, Technology, Reading, Engineering, Arts, and Mathematics. 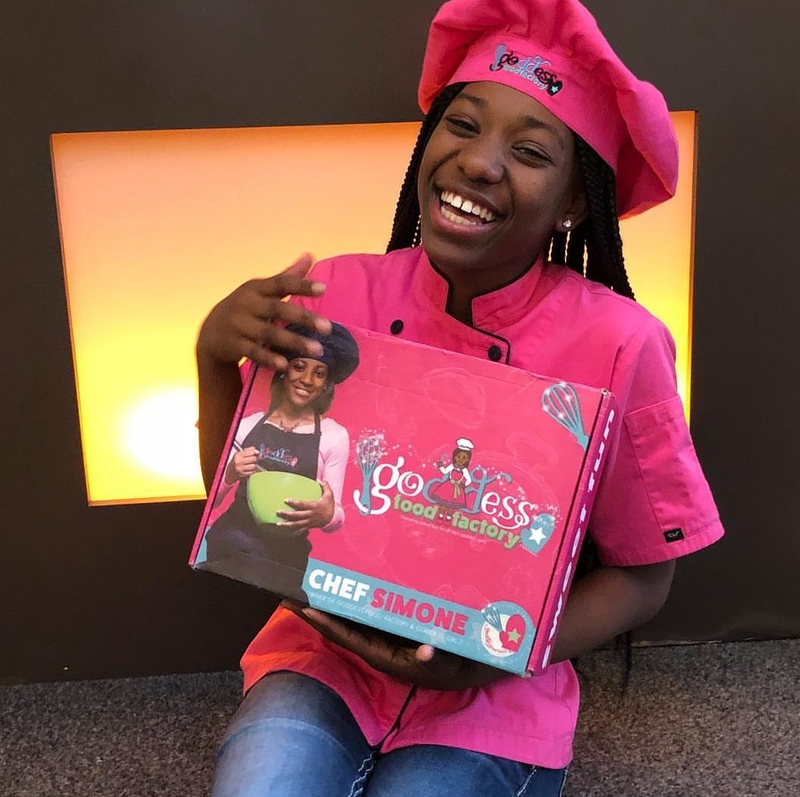 As a motivational speaker, Simone has spoken to audiences of all ages about kitchen safety, her appreciation for food, good moral character, marketing, branding, financial budgeting, and entrepreneurship. She is also the host of Teal Talk with Kids + has participated in major food festivals including Food and Wine Noir in Atlanta, Georgia, “50 Women in Philly are Cooking” in Philadelphia, and won for having the Best Display amongst all of the chefs at the Taste of Black in Jacksonville, making her the youngest contestant to ever win in the seven years of the competition. 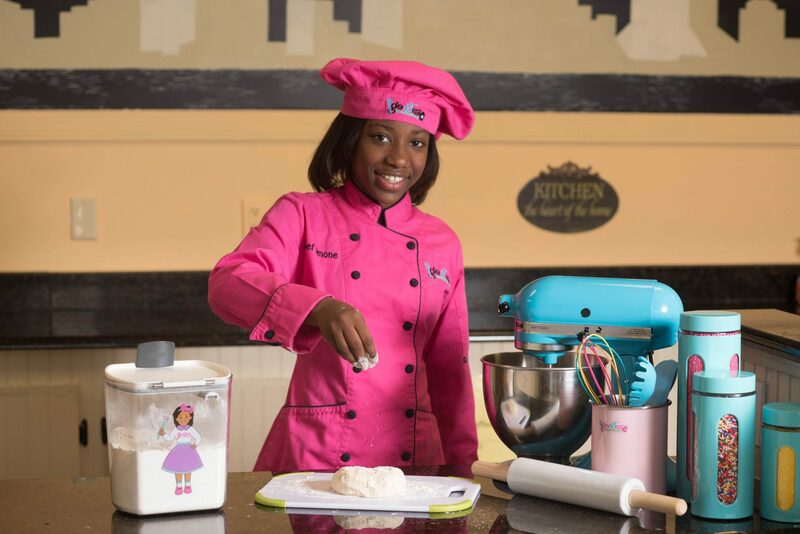 This Pastry Princess has stated that her vision is to inspire young kids around the world. Her goal is to share her love of baking and cooking with everyone and to own a chain of bakeries and restaurants. Since we have your taste buds jumping, let’s get to know Chef Simone a little better! Baking is such a beautiful expression of your passions, personal style, + interests in life! How did you begin whipping up tasty treats? That’s a long story, but I started by baking with my grandma, Phyllis Williams-Harris when I was 3 years old. She’s a baker and she would always let me lick the spoons when she baked cakes. Later, I started helping her bake by measuring ingredients and stirring the batter. When I was five, my parents bought me an Easy Bake oven for Christmas and then I baked treats for my cousins. I was added my own special ingredients to their mixes to make the dishes my own. With more baking sessions taught by my grandma, my skills increased. At age 11, I told my parents that I wanted my own bakery for Christmas. Voila! Now, I have my own store, called Goddess Food Factory. I sell all kinds of desserts and educational baking kits. We sell chef merchandise too, like aprons, chef hats, t-shirts, mittens, and more. Oftentimes girls don’t get the spotlight they deserve when it comes to STEM. How were you able to pour your love of science + math in creating recipes for your ExS.T.R.E.A.M. Baking Subscription Boxes? Creating recipes is very easy because I’ve been baking at a really early age. Over time, kids would always ask me for my recipes, so I decided to create baking kits for them to enjoy at home. As a youth advocate for STEM, I knew that I couldn’t have just a plain old baking kit. So, I combined both of my passions (baking and science) together and voila, ExS.T.R.E.A.M. Baking subscription boxes was born. As the popularity of by subscription boxes grew, I knew I had to do more to push STEM. Being a kid, I know what kids like and how they like to learn. So. I created a hands-on, interactive program called EXS.T.R.E.A.M. Baking, which has standards based lessons that are taught using culinary concepts. I travel to organizations nationally and conduct workshops to facilitate the program. All of the students are always actively engaged and they have so much fun. STEM evolved to STEAM due to the importance of the Arts. Plus, we all know that Reading is fundamental and it’s the foundation of everything. Therefore, I wanted to ensure my program included reading. More importantly, STEM/STEAM/STREAM are the jobs of the future since the rapid advancement of technology in every field. Kids of today must be ready for the world of tomorrow and that’s why I’m an advocate for S.T.R.E.A.M. (Science, Technology, Reading, Engineering, Arts, and Mathematics). As a student it can be tough to fit cooking in your sched! What are two easy dishes students can make on-the-go? I’m a person who can eat breakfast anytime of the day. So, one dish can be an omelet. It’s full of protein and can be easily made with eggs, any type of meat, chopped tomatoes, onions, bell peppers, salt and pepper. Another quick and easy dish is one of my favorite light snacks. It’s a stuffed apple. You take a whole apple, tear off the stem, and core out the middle of the apple, but not all the way through. Then, you stuff it with your choice of toppings. I normally use caramel, pecans, and whipped cream. Bon Appetit. It’s so delicious! Being young and having responsibilities can sometimes get to be a bit overwhelming, how do you regroup and motivate yourself when you’re feeling a little defeated? One thing that would surprise people about me is that I talk to myself in the mirror in third person. LOL It’s inspirational though. I also write myself positive messages and place them in a jar. Whenever I have a bad moment and need recharging, I take out one of my messages and it cheers me up. My sister calls me crazy, but it makes me feel good. I love positivity and I’ve found that my uplifting pep talks to myself helps me to have a great day. Empowerment happens when you share your gift, your wisdom and your stories with others. It’s like teaching them how to bake a cake. You have to explain which ingredients to use and the quantity, give step by step baking directions, and teach them baking hacks that will equip them with mastering a delicious cake. Then, you watch them bake more cakes while giving advice and praise. The next thing you know, they feel empowered enough to bake cakes on their own and teach others how to do it too. My advice to other girls who want to make their dreams come true or start a business is simple – Start today. Start now. Get into action, Do the work, and NEVER GIVE UP. It will not be easy, but it will be rewarding. No one told me to start selling my treats. My grandma has always baked cakes and sold them. I saw her making money from the baked items, so I started making cookies and charging a quarter (age 6 or 7). When my parents found out, I didn’t get in trouble. They just told me that I wasn’t charging enough and to charge at least fifty cents. They helped me to create a price list and helped me call family members to get orders. I didn’t realize it at the time that I had a small business. I was making a lot of money (to me at the time) from selling cookies and I was having fun. Now, I sell cookies for two dollars each because I understand the cost and work that goes into baking. I’m also a motivational speaker, so I encourage other kids by telling them how I overcame obstacles. There is a solution to every problem. The key is to only focus on the solution. I would also advise for parents to truly support their kids dreams and help them out. I would not be where I am today without my parents, my support team, and my community. Check out more of Chef Simone here!